Capital Lighting & Supply, a Sonepar USA Company, is a premier provider of electrical products and lighting with 21 locations serving Maryland, Virginia and the District of Columbia. The distributor uses a StrandVision Platinum Digital Signage package and site licenses to augment its customer communications across its network of parts counters at its 21 locations. Capital Lighting & Supply (CLS), based in Alexandria, VA, provides electrical products and lighting to contractors, as well as industrial, government, residential and commercial customers, through a network of 21 locations serving northern Virginia, Maryland and the District of Columbia. Each location has a parts/service counter frequented by customers. The counter is a prime selling opportunity for CLS to make customers aware of its offerings and specials. CLS has taken advantage of the opportunity in the past with point-of-sale posters, tent cards and other displays to supplement its regular newsletters and customer magazine. Jordan Laycook, CLS Senior Marketing Manager, discovered StrandVision digital signs at a tradeshow. He took a business card and looked further into using digital signs once he returned to the office. He and his staff felt that digital signs would be a worthwhile addition to their point-of-sale materials and decided to pilot an installation at the Baltimore location. The company subsequently installed StrandVision Digital Signage at all of its 21 locations. Commented Marianne McGhee, CLS Marketing Manager, "We were able to use it as another avenue to communicate with customers and introduce new products and services." Jordan researched vendors and spoke with Amy Hansen at StrandVision, who introduced him to StrandVision's Internet-based digital signage. She also hosted an interactive Web demo. 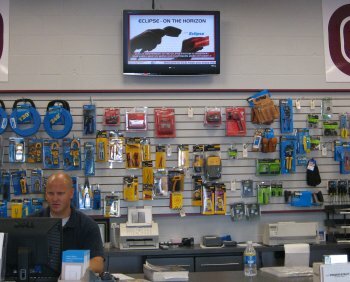 Forty-two-inch LCD screens were installed over the parts counters, and Capital Lighting's IT Systems Administrator and Webmaster handled setting up the computers and making the Internet and other connections. CLS has effectively merged the StrandVision Digital Signage into its marketing mix, adding to the company's ability to get the word out. The digital design closely coordinates with other marketing efforts. Marketing develops campaigns that may include the digital sign. The graphic designer who develops CLS' newsletter, magazine and other marketing materials, handles the digital signage content. The new content is posted to the StrandVision system. Content includes several slides that promote CLS products and services, local and national news and weather, and a healthy serving of sports. It also features special promotions, contests and pictures of CLS customers. "The promotions where customers can win prizes build stronger relationships. We take a photo of them and put it in our newsletter and on the sign. Customers like to be up on the screen," said Marianne. As a StrandVision Platinum subscriber, CLS is able to pay for the system by showing vendor-supplied videos as part of the rotation. CLS is happy with the installation. It's become part of the marketing mix that influences customer behavior and preferences. Commented Marianne, "A customer may not need something that we're promoting at that time, but if he remembers it later, it helps. "Our manager in Baltimore says that they've gotten good customer comments. [The digital sign] causes conversations between our customers and our counter personnel," concluded Marianne.